This resource is part of a collection called Teaching Art to Year Three. Following my AccessArt Award of ‘Talented Art Teacher Winner’, and with the AccessArt team kindly announcing that I impressed them with the ‘sheer energy and range of work with the children’, I have been invited to present a series of projects. The projects share a range of ideas I have used in art lessons over one year, with a particular year group, in this case Year 3. This post is intended to inspire and give food for thought rather than as blueprint for projects, as I recognise that we are all working in very different environments, with restrictions of materials, time and space. Some are lucky enough to have more freedom than others but the pressure of levels, targets and SATs within the core curriculum has seen a squeeze on creative subjects. 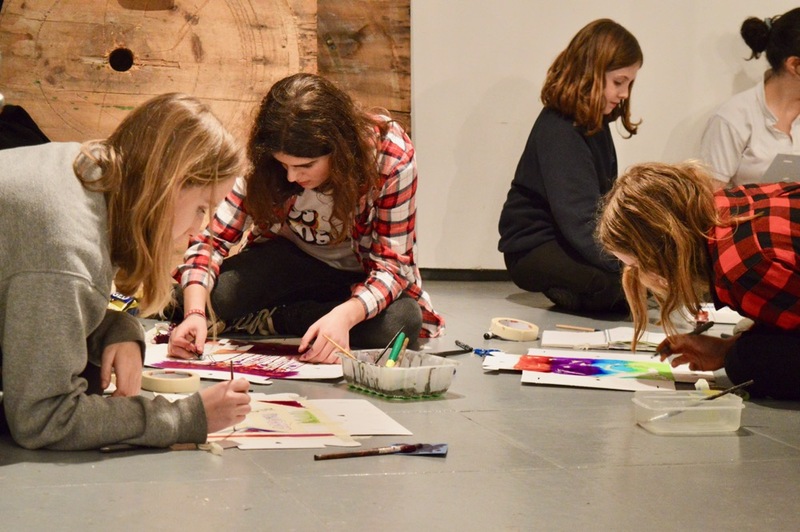 It is so important to ensure children experience regular opportunities to practice the main skills associated with artists, makers and designers. I remind the children that everything that surrounds us needs designing – The UK’s creative industries contribute £92bn to the economy; that’s £10million per hour! The projects will be a snap-shot of the work produced over one year by my mixed-ability class, aged 7-8, teaching them weekly for an hour. They are currently working on a Japanese theme which relates their art projects to their class topic. Other considerations, when planning, ensure the children have opportunities to work on a variety of scales, formats and surfaces using a range of materials and techniques. My aim is to develop children’s confidence in their knowledge and understanding of processes and be informed by contemporary and International art (although we do reference historical work and the big heavy-weights of the art world). I celebrate all children’s work together on display and encourage my older GCSE students to work alongside classes of younger children. More often it’s the younger ones providing the positive attitude and inspiration with their willingness to explore any new challenges presented. Techniques are demonstrated but I encourage children to vary and add their own twist, personality and interest. Feedback is verbal to individual pupils and I avoid giving them numerical marking, focusing instead on encouraging the positive and improving aspects. I hope to inform AccessArt readers by showing PROCESS, sketchbook drawings, through to PRODUCT, final pieces, that are developed over several lessons. The images will illustrate the different outcomes reached by the children, celebrating the interest and variety of individual responses. I currently teach Art, and also Design & Technology, to children aged 7 to 16 at Moreton Hall School, Oswestry, Shropshire. I have over twenty years’ experience teaching Art to children from age 3-18 and have (honestly) never repeated a single project during that time. Inspiration for my projects comes from art exhibitions, museums, art books and having a camera permanently around neck. My degree in Illustration drives my interest in ensuring drawing features centrally in all projects, at the beginning as well as throughout and in all media. I particularly enjoy developing print and mixed media pieces with my classes as it gives children the opportunity to have an individual response. I facilitate AG&T children running their own lunchtime club and I also manage an after school club. I am the Editor of an Art broadsheet published for Independent schools and hold themed art workshops for large groups, inviting several local schools to attend. These are well subscribed to as the children go home with finished large work and it is a good opportunity for teachers to liaise and discuss projects and products. I manage to secure sponsorship for all the art materials from our local educational supplier. I hope to share one of these projects over the next few months. All children have a good quality sketchbook and observation is a key skill that is developed. They are available for children to test colours when painting or try out techniques. As well as using them for research, they draw from observation and are encouraged to sketch for pleasure from imagination in the back of the book during free time. Sketchbooks used for observations, research drawing and experimentation. I always incorporate a mixed media piece each year to give children the opportunity to explore creative processes; given limitless choices of materials as they layer wet and dry materials. Often they work larger than A2 size and I expect them to work standing up to create bigger marks. They are not mimicked techniques but children are introduced to methods, share findings and learn from each other by sitting with different peers each lesson. Tea stain, shoe polish, wax candles, food colouring are used alongside traditional materials. Exploring colour through mixing and layering materials and working on different surfaces including plastic and black card. Recording through different types of drawing is paramount. Children from the youngest age are familiar with using a range of pencils – HB, 2B, 4B. Erasers are used to add texture in tonal areas, but are not relied on to erase mistakes; changes are built into their work. Drawing is used for different reasons with types of line, weights of line and mark-making being encouraged and considered. Drawing themes, to develop their observation, from anywhere. Transparent shoe storage boxes are perfect for storing objects of interest to draw. Labels can be dropped in the front and moved around. Natural objects are perfect to begin the collection and children are keen to contribute with shells, pine cones, dried gourds, seed heads and flotsam & jetsam. A few more boxes can prove invaluable with small plastic animals, packaging, pieces of machinery, cups, old tools, even light bulbs, pegs and pasta have made good objects to observe and draw recently. I found visiting charity shops and car boot sales are good starting points. Drawing in ink with found materials. 3-coloured pencil technique- converting tones into red, yellow and blue. 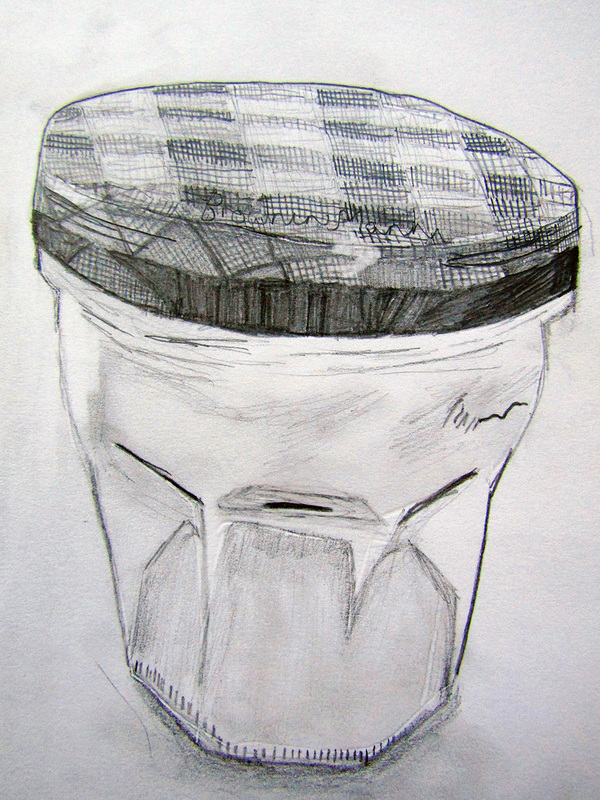 Observation drawing capturing the shape, form and material, using HB, 2B, 4B pencils. Drawing on A1 paper, even for the youngest children, is commonplace – A2 is used for larger classes. We often tackle the expanse with graphite sticks and a range of pencils over several weeks or work quickly and spontaneously with inks. Developing confidence to daw on a large scale is important. 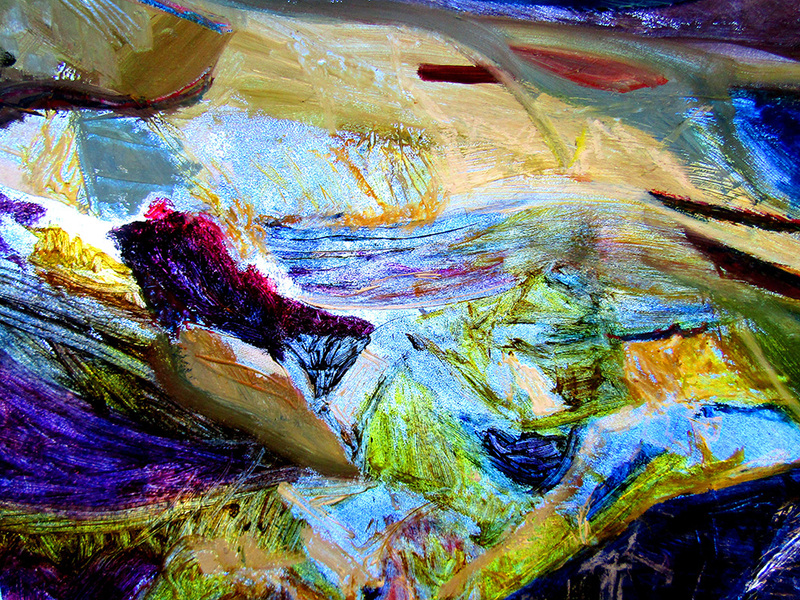 Large coloured mixed media pieces are then developed over several weeks. Shared drawing is something we undertake to encourage children to work on the same paper. This ensures they do not fear mistakes and working on top of others’ drawings encourages the notion of continually changing and improving. Using a variety of marks and lines is vital to add interest to work. It avoids children using smudging and striving to produce photographic realisms at the expense of creating an interesting drawing. The inclusion of thick and thin lines can be used in any media. I try and turn ‘stitched’ lines into confident ones and appreciate that all responded differently. Drawing knitting – A2 size, selecting from Indian ink, paint, printing ink and using asst. tools other than brushes! I do not shy away from working 3-dimensionally and particularly enjoy seeing children exploring the limitations and possibilities of found materials. Often the 3D work then allows children to engage in photography and these objects and the images can then be worked from to create their 2-dimensional work. When space is limited, the children simply work small-scale in the model-making, and the work is stacked in fruit trays to dry. Materials are often found or reclaimed, or as simple as using papier-mâché. The Sea. Found and recycled materials- foam, old shirts, plaster, pillowcase stuffing, beach combing. Wire, plaster, clay, old paint brush bristles. Each year sees the children build on their earlier experience. Printing, for example, develops over the key stage; from sticky foam, potato prints, mono printing, 1-color quick print to 3-colour quick print, collagraph and scratching into plastic to create mock-etching. We are lucky enough to have access to screen printing and a printing press, but these are used very occasionally. Instead they learn, and practice, to control printing using pressure and quantity of ink. Children enjoy the physical and tactile nature of printing and they use small, old wooden tie presses to add pressure. Planning is flexible and this allows children to steer projects by repeat printing, and adding to, with the ability of extending the task. 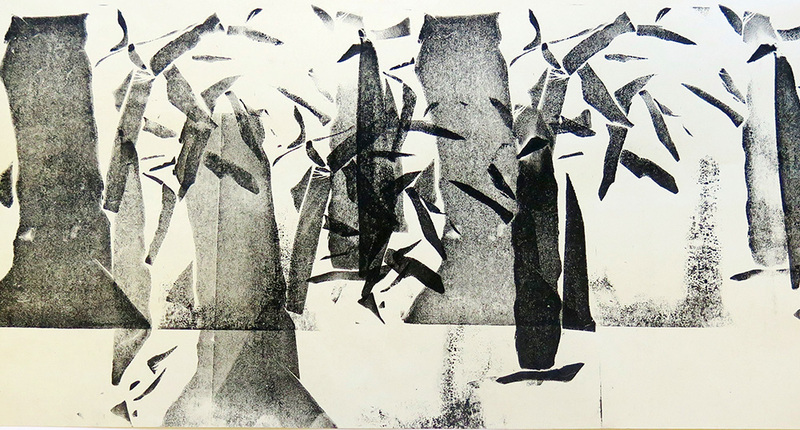 Press print, monoprint, lino print, printing with found materials, collagraph printing plate, foam. Children from the youngest age group are familiar with the properties of different paints, so they can make informed choices, although they are always learning. When working on a sustained piece, lessons encourage children to resource the materials they need. Children familiarise themselves with some key paint names from an early age. At the end of painting lessons, left-over colour is used to paint scrap papers and print patterns using rollers, children love to help with this. These are used for collage and mixed media work, providing instant and often usual colours. There is no waiting for drying time and washing palettes, with the children using the collage to plan and explore colours alongside each other more thoughtfully. Choices of collage – ready-made colour and pattern. Children are more proficient than ever with photography, especially with the use of quality phone cameras. Children use the camera to photograph their 3D models. They control lighting with torches and lamps and experiment with coloured card for the background. To identify their model, they include their initials on a small piece of paper in the shot. Photo Editor, as part of Microsoft Office, allows the basic editing tools of cropping, varying the contrast, colour, lighting etc. to be used by younger children. Photography is built into most projects. I try and add a creative effect into their photography especially when combined with 3D. Recently, the children made some small simple clay models of coral and used found materials with interesting texture, tied together with pipe cleaners, and dipped into plaster – bubble wrap, twigs, plastic flower, packaging, paper straws, and fabric. Once hung down to dry stiff, the models were all photographed together with an acetate projection of their coral drawings over the top. Often photography is used to create a composition by capturing a close-up of a 3D piece or objects. Whilst drawing from real life is by far the best practice for children to look carefully, they do prefer to work from photographs. Even the young Year 3 children use a simple 4-square grid to scale up accurately and are able to then refer to the photograph over several weeks. Dipping found materials in plaster, exploring projection through photography. Angles, lighting and composition are explored through photography. Creating compositions from collaging elements of photographs have made worthy creative starting points. Cutting images, often printed or photocopied on various sizes, gives the children creative choices; they find making decisions challenging. Children are often involved in the photographing and sharing of images as I avoid simply handing out images to work from. Through careful cutting they explore size, layering, cropping, overlapping and looking for repeated shapes to add further interest. They enjoy asking for peers’ opinions and once glued, they take ownership, and increased interest, of their compositions. Layering – 2 images together are combined and used as inspiration to explore pattern, colour and negative space. They are given a choice of materials. They developed an understanding of the limitations and possibilities of materials including wax resist, as well as adding textures with sand and salt. Teachers can act as facilitators. I occasionally surprise the class with unplanned lessons, which are called – ‘simply respond’. A recent lesson found the children faced with slices of tree trunk, twisted branches, logs and knotted pine timber. The natural inspiration was coupled with a box of wet and dry materials, such as inks, candle wax, pastels, watercolours, markers, charcoal etc. They tended to work without talking, some making a hesitant start; others dived straight in, feeling and smelling the wood, examining it closely then exploring the materials. Some used all materials simultaneously; others limited themselves to ones they felt most confident with. ‘Simply respond’ – paper straws and thin wire was what welcomed children when they came to an Art lesson. Seashells were their inspiration. They were given just 15 minutes to make a structure before drawing their model, giving equal consideration to the shadow. ‘Simply Respond’ – printed patterned paper, images of Portuguese figures in historical costumes, scissors and tape. Making clothes in small groups was enjoyed by all but observing the dynamics and team building was the most interesting. They had to plan and discuss and allocate roles- designers and cutters. They tried to re-create folding and pleating techniques from the images of the baggy trousers. 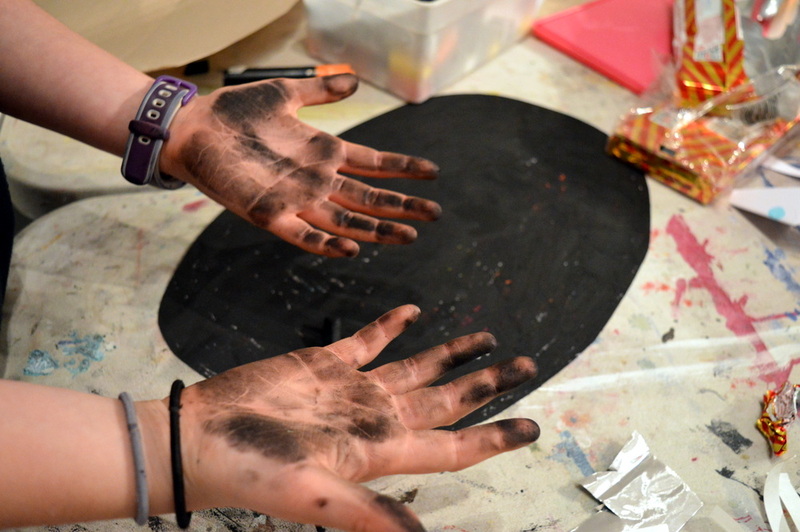 The clothes were drawn subsequently in a 45 minute session with grey and black paint. A Turner prize quiz; ‘An Eight Year old could make that’ discussion – questioning modern art; can Art, such as Gormley’s ‘Another Place’ figures, be on a beach or does Art have to be in a gallery? Topical or newsworthy – what makes the Salvator Mundi worth $450 million? Some of the most enlightening art discussions begin with one child’s visit to a gallery at the weekend. Adding an unplanned lesson is necessary, in response to a gap in their understanding. Drawing using perspective is a difficult task for any age. I try and build drawing, with some element of perspective, into all year groups and introducing it early is worthwhile. Once they can create something that appears 3D and ‘jumping of the page’, they are keen to practice. A successful project was drawing boxes that were turned inside out to create assorted white shapes. Each table had a couple of boxes and children worked on beige sugar paper identifying parallel lines and adding dark, middle and light tones to the mid-tone paper with chalk and charcoal. Looking for lights, darks and the tones in between. Sometimes we use sponges to quickly rid the white paper, making it less daunting to work on. Children feel white paper highlights mistakes from the start and immediately ask for erasers. Embossed wallpaper glued around a poster tube will create a textured continuous printed surface, or you can purchase textured rollers. We tend to work large and fill the page so little background remains, but when working in charcoal or pencil, sometimes the background benefits from the white space. Often we like to fill backgrounds with a flat colour and mix a pot of poster paint and white emulsion which unifies the work and provides an inexpensive thick chalky colour that hides all the unwanted marks. Small printing blocks were used recently to fill the background quickly with colourful texture but to be truly effective, the children needed to have a masked-off area. This is easy with thin newsprint or tracing paper and if the shape is big and simple and is held on with a couple of bits of sticky-tac. It is a good skill to learn early to avoid cutting designs and gluing to a separate background. Background added last – Ink and press print background. Background added first – screen print. This is primarily through verbal feedback. I photograph their work in progress so they can self-assess their own and peers’ work. It is an effective method to make a stop and evaluate the successes and target areas to focus on. They are encouraged to name two aspects that went well and two areas to improve with children working in pairs to review. It is a visual record for sketchbooks when classes change teachers and act as starting points to aid writing reports. Children evaluating at the end of a project helps to steer future schemes of work. If we can ascertain what they enjoy most then this is a sound base for subsequent plans. I sometimes use a whole school theme, linked to a country or period in history, as a starting point for the term’s art. Research can be used with all classes and the library can display research books. Often the same starting point, theme or painting is developed through several pieces of work by the class and across year groups. All appreciate seeing the other classes’ work progressing. Work is displayed and celebrated throughout, as well as at the end of the project. My expectations are high for all children and they respond to this. My primary classes will tackle any challenge I present, as they believe I have confidence in them. Having a smaller group allows the use of specialist materials such as masking fluid and children enjoy using new techniques and processes. Water is sprayed onto paper and a base layer of colour wash is put down, before a quick blast of the hairdryer. Masking fluid is drawn on using the wooden end of the paintbrush before another dry and another layer of colour. The process is repeated, drawing with masking fluid or just adding marks and stronger colour stronger is build up. The fun comes when the image is rubbed and the masking fluid peels away to reveals the lighter coloured marks. The effect is similar to paper batik with melted wax or drawing into ink with bleach. Ink and print with masking fluid. I teach art to all classes age 7-11, allowing me to plan and monitor their projects carefully. However, it is important when working with a new class that you have knowledge of their prior experience to avoid repetition and to build on skills. Each September, when meeting Year 3, I look forward to nurturing new artists, with the exciting prospect of building their knowledge. Often, art projects must tie in with class topics or cross-curricular links with History or Geography. If I have time to research art from that period or country, it can be very successful as the children are already interested and knowledgeable, and class topic books help develop initial sketchbook research. It is also interesting for the teacher to learn about the many different styles of art too. If you are teaching several subjects, Art may not be your specialist subject. If you have the theme of Romans each year, it could still be tackled differently with some research books or searching the internet for inspirational images. Even if you are restricted by plans and limited by resources you can be creative with just some inexpensive sugar paper and charcoal. Even if you have to repeat projects seen on the walls and shelves the previous year, remember that the same children will not have experienced projects before, so it will be new and exciting to them. You can improve through the experience of teaching it more than once, taking the best aspects forward. I try and plan for 2 x 2 year blocks for KS2 juniors. 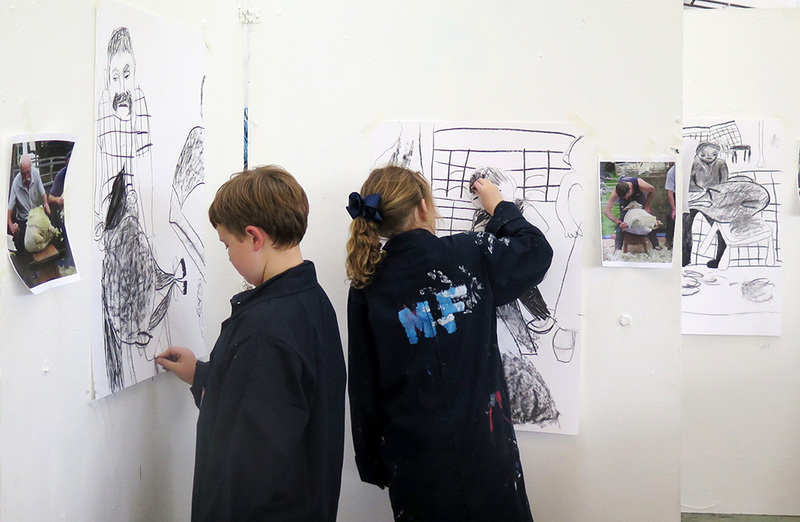 Each 6 – ½ term cycles will ensure the children experience an opportunity to develop several main pieces: a large-scale pencil drawing, two large mixed-media pieces using wet and dry materials, a layered painting, two types of printing, 3D- often using papier-mâché or found materials and ceramics, as well opportunities to work in charcoal, collage, etc. This is not a rigid list and is supported by sketchbook work. I also teach Design & Technology and use their making projects as an extension of their art project by addressing the 3D element but increased meaning. When children work from a historical painting in Art, their D&T projects run concurrently. A moving picture with mechanisms, such as sliders and pop-ups, explained the key features of the painting. This developed into their subsequent projects, taking inspiration from one of the characters in the painting to design and build a pop-up puppet and marionette puppet. They progressed onto building a moving wooden framed toy using cams to illustrate the painting story. D&T projects require drawn plans and purposeful design, so utilising their art research is ideal. Mechanisms and structures – making a moving toy or clock explain the content of a historical painting.